Ever suffered from information overload? Finding simple pieces of information can feel like a daunting task. With all the choices and sources of information available on the internet today, it's absolutely necessary to find a way to prioritize, filter, and professionally deliver appropriate information. Recommender systems resolve this problem by searching inside large amounts of generated information to provide users with personalized services, information, and content. In very simple words, a recommender system is a subclass of an information filtering system that predicts the "preference" that a user would give an item. 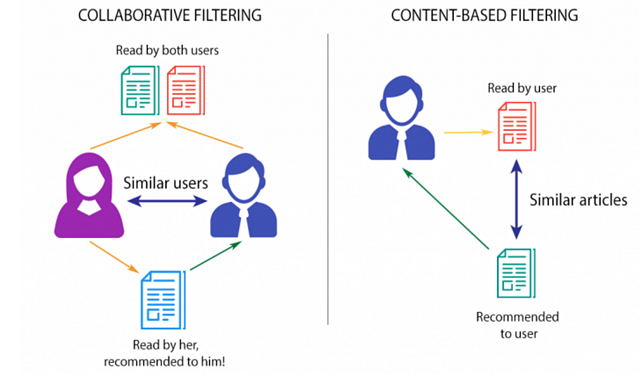 Collaborative Filtering (CF), filters information by using the recommendations of other individuals. It's based on the logic that people who agreed in their assessment of some items in the past are expected to come to the same consensus again in the future. An individual who desires to read a book for instance, may ask for recommendations from friends. The recommendations of certain friends who have similar interests are trusted more than recommendations from others. This information is used in deciding which book to read. -The selling point of CF engines is that they're totally independent of any machine-readable representation of recommended objects, and work well for complex objects such as music and movies, where differences in taste are accountable for much of the variation in preferences (Good, Nathaniel, et al)2. -CF engines suffer from the "new item" problem - until an item has had some interaction with users, there is a lack of data to properly classify and recommend it. A Content-Based (CB) filtering system selects items based on the correlation between item content and user preferences as opposed to a CF system which chooses items based on the correlation between people with similar preferences (Meteren, et. al)3. Hybrid recommender systems combine two or more recommendation methods, which results in better performance with fewer of the disadvantages of any individual system. Typically, CF is combined with another method to help avoid the ramp-up problem. For example, a weighted hybrid recommender is one in which the score of a recommended item is calculated from the outcomes of all the available recommendation methods present in the system. So then, the simplest combined hybrid would be a linear combination of recommendation scores (R. Burke)5. 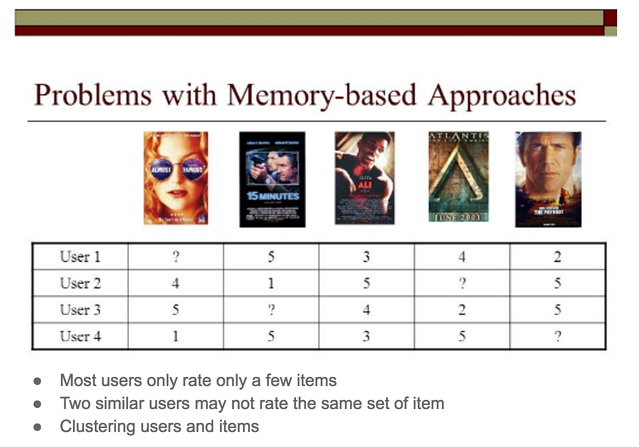 Are recommender systems useful? In 2006, Netflix offered a one million dollar prize for anyone who could advance their recommender system algorithm by a minimum of 10%. There were over 44,000 entries from over 41,000 teams on behalf of approximately 51,000 contestants. On 21 September 2009, the grand prize of US$1,000,000 was given to the BellKor's Pragmatic Chaos team who used tiebreaking rules (S. Lohr)6. By decreasing the error of their recommender system, Netflix was able to boost business and create profit tremendously. It's clear, then, the value that a great recommender system brings for users. But how can we create them? After learning a bit about recommender systems, it's time to build a simple one using AML. For this, we need to have an AML account, which is free, and some data. First, extract the downloaded file and select rating.dat from the listed file. The format of this file is “dat”, so we need to convert this file to a CSV format. After that, select the DATASETS module from the AML main menu, click on new icon on the bottom-left corner of the page, then upload the converted file from the local storage of your PC to AML. While uploading, select the file type as CSV without a header, and name that file “rating”. It will take some time to upload. Name your experiment at the top of the page. For example: “Recommender Systems”. From the left hand-side menu, open saved datasets and drag your uploaded dataset ,i.e., “rating.csv” from my datasets. You can see some information about this file by right-clicking on the reader module and selecting Visualize from the menu. As shown in the picture above, there are 4 columns in the dataset with 1,048,575 rows. The first column is related to the user ID, the second column is for the movie ID, the third column corresponds to ratings, and the last column is for the timestamps. In this experiment, we will only be using the first three columns. We can select the three required columns using the specific module in AML called “Select Column in Dataset”. 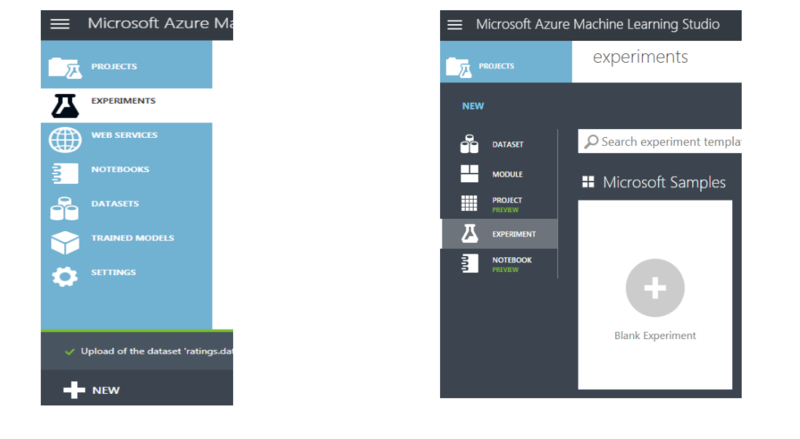 Just search the name of this module in the search box on the top-left of your experiment, and then drag and drop it into your experiment environment in the provided space. -Fraction of training only users: Specify the fraction of users that should be assigned only to the training data set. This means the rows would never be used to test the model. -Fraction of test user ratings for training: Specify that some portion of the user ratings you have collected can be used for training. The left hand side output of this module corresponds to the training dataset, and the right hand side port relates to the testing dataset. 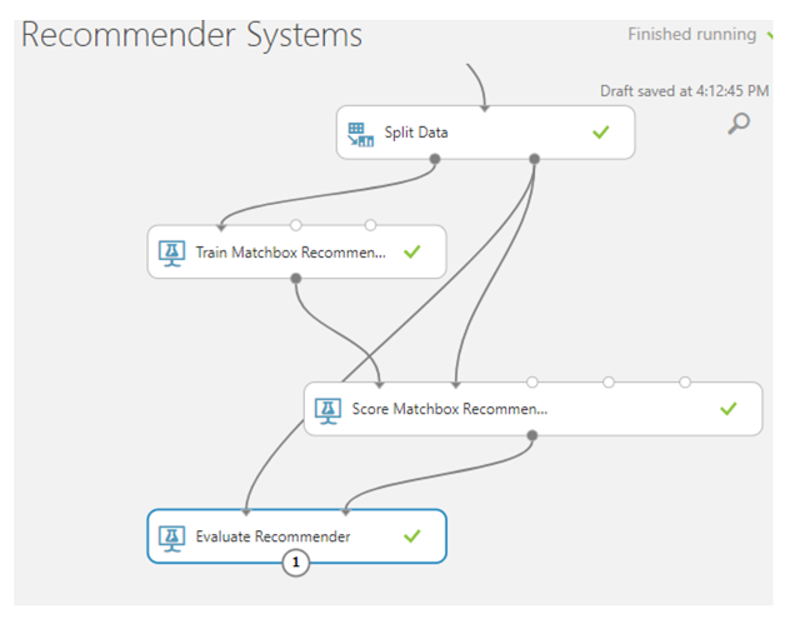 After running the model, we'll have following results in the “Evaluate Recommender” model. So, by using this simple model we were able to reach 88% accuracy with the testing data set, which isn't too bad. If we want to boost the results, we need to use a more advanced model and datasets (e.g., hybrid models and other datasets available in a downloaded bundle). In this blog, we employed AML to build a recommender system using data related to movie ratings. In the end, we were able to reach 88% accuracy in the testing set. Moreover, we created and deployed a web service as well. 1 "1 Collaborative Filtering Rong Jin Department of ... - SlidePlayer." http://slideplayer.com/slide/5005595/. Accessed 21 Nov. 2017. 2 "Combining collaborative filtering with personal agents for better ...." 18 Jul. 1999, http://dl.acm.org/citation.cfm?id=315352. Accessed 21 Nov. 2017. 3 "Using Content-Based Filtering for Recommendation - CiteSeerX." http://citeseerx.ist.psu.edu/viewdoc/download?doi=10.1.1.25.5743&rep=rep1&type=pdf. Accessed 21 Nov. 2017. 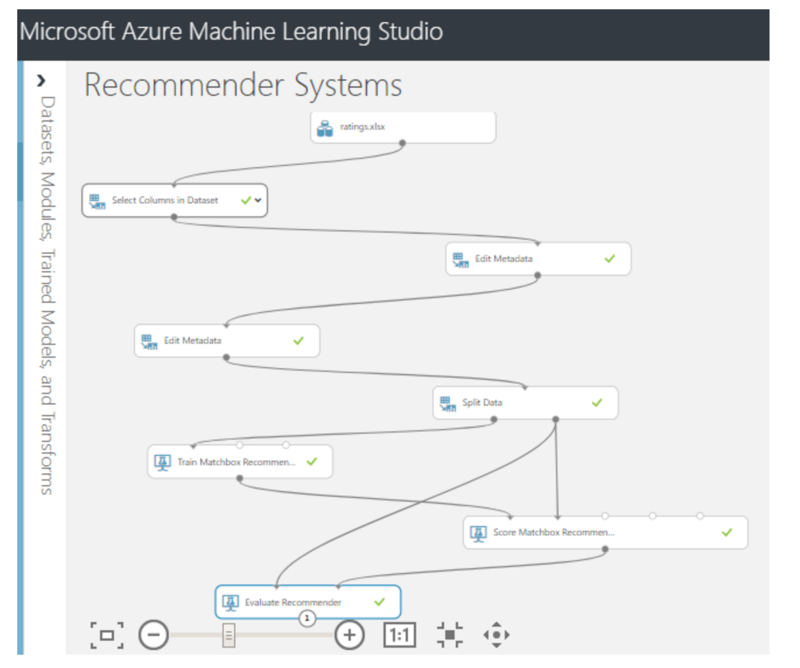 4 "How do Recommendation Engines work? And What are the Benefits?." https://www.marutitech.com/recommendation-engine-benefits/. Accessed 21 Nov. 2017. 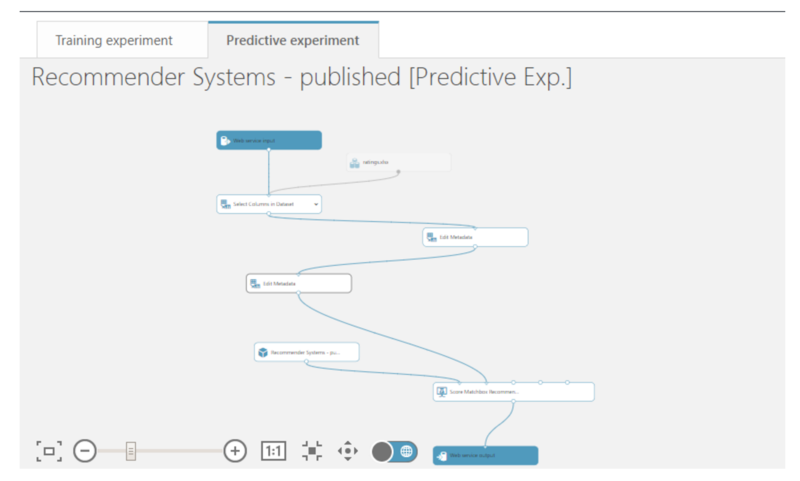 5 "Hybrid Recommender Systems: Survey and Experiments ... - CiteSeerX." http://citeseerx.ist.psu.edu/viewdoc/download?doi=10.1.1.88.8200&rep=rep1&type=pdf. Accessed 21 Nov. 2017. 6 "A $1 million research bargain for Netflix and maybe a model for others." 21 Sep. 2009, http://www.nytimes.com/2009/09/22/technology/internet/22netflix.html?pagewanted=all. Accessed 21 Nov. 2017. 7 "MovieLens 1M Dataset | GroupLens." https://grouplens.org/datasets/movielens/1m/. Accessed 21 Nov. 2017. Hossein Javedani Sadaei is a Senior Data Scientist at Avenue Code with a post-doctoral in big data mining and a PhD in statistics. He works mostly with machine learning and deep learning in retail, telecommunication, energy, and stock. His main expertise is developing scalable machine learning and deep learning algorithms using fuzzy logics.